I swear…we’re meant to be. I can’t get over how adorable this interview is. He’s so talkative. What is it about players taping up the sticks for the game? It’s instant drool. Here you go — to help you with your withdrawls…which I’m sure are getting worse with all the you know what talk going around. Stop making me NOT hate you. To the dark side I go! Not sure when this video came out — but S sent me a link FULL of goodies for the off season that we be sharing periodically to keep you all satisfied. Anyway, I’m not going to lie — this video confused me the first time around. Then I realized the guys were just ragging on each other the entire time. 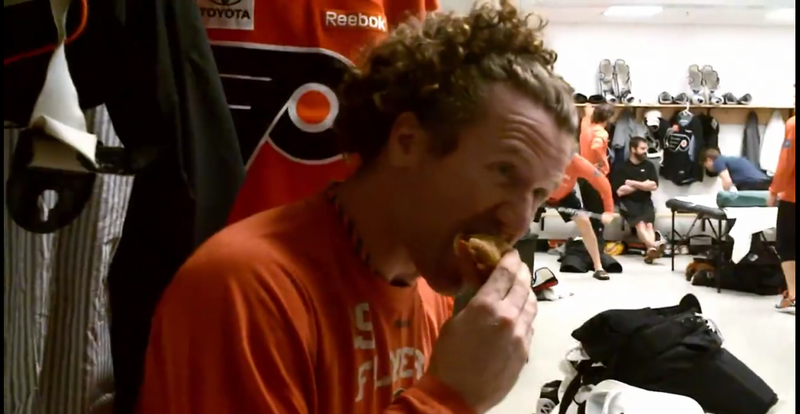 You get to watch Hartnell stuff his face with a Meatball Sub while at Boston University (WOOHOO!). Other appearances made by: Talbot, Giroux, Jagr and a few others. Scott -- can we have some?? Sharing is caring. Flyers lead the Devils 1-0! Good job boys! 3 to go!